Countrylane bowl - 8½" (215 mm) diameter, 3½" (88 mm) high. Countrylane Pottery was set up by Anthony Richards when he sold Penderleath Pottery. For many years Anthony threw earthenware pots, usually brush decorated. 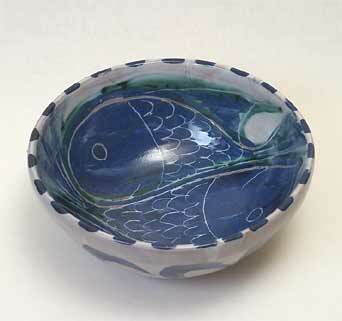 Nowadays he seldom throws, but fires bowls, plates and planters that are decorated by his wife, Christiane. The work is very similar to what they produced in the 1960s when Anthony ran Arch Pottery and Christiane the Cellar Pottery. He uses a 20 cu ft electric kiln.